These original paintings were done on 4×8 foot canvases, and used as upholstery on restored antique furniture frames. Each painting is original and no two pieces of furniture are the same. Concept by DeWayne Lumpkin. Paintings done by CMagellen, both of Southern Oregon. This furniture series was first exhibited in July 2010 in Redondo Beach, CA. 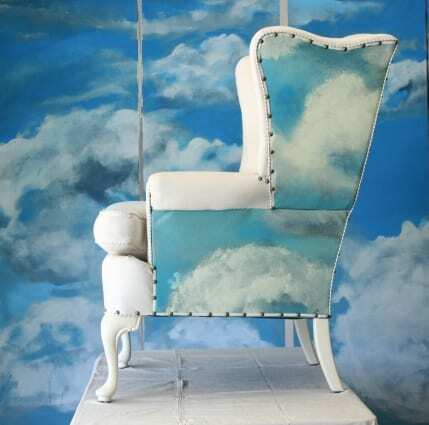 Backdrop for chair is a 8×12 foot, 6-panel painting, also by Magellen.